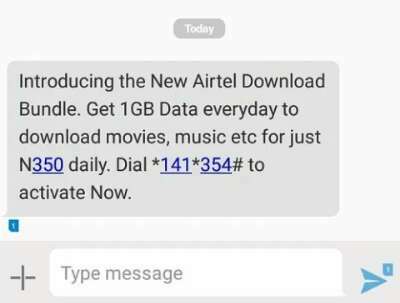 Airtel Download Bundle is a new plan targeting customers in need of downloading stuffs online with low budget. Maybe you want to download big games, movies or software update, then this plan is perfect for you. You will get 1GB for N350 which valid for just 24hours (1 day). With this new data plan, Airtel NG has responded to the recently launched Glo special data of 1.2GB for N200 to continue claiming of being the grandmasters of data as customers gets up to 12GB for N2000 in a month. On a similar scenario, Airtel is another network that values internet data so much hence the nickname “the smartphone network”. For instance, some Airtel subscribers are still enjoying double data offer and free 4GB data if you successfully purchase or upgrade to a new 4G Sim. You can dial this USSD code from an android smartphone, iPhone, blackberry, Symbian and even java phone and it works on all these platforms. Note: this offer is valid just for a day and works on all mobile devices and Personal computers. The only difference between this offer and that of N500 for 1GB valid for 7 days is just the duration. If you don’t have anything to download, no need going for this offer except you just want to experiment with it.